I decided to write this tutorial as many of the others on various sites seem to miss key parts of what should be a straightforward install. MariaDB is the latest version of mysql and uses as far as i can see the same code and commands as mysql. Starting MariaDB.180326 06:04:54 mysqld_safe Logging to '/var/lib/mysql/com.err'. That should do it mariadb is all ready to go ! Every Unix Administrator has had this at some point… have written a script that extracts multiple rows with values in each column that you want to add up to get the total…. And every Unix Administrator will have written a 4-10 line loop script using pure bash or an awk script to add them up. Well… here is a solution to do it all on 1 short line !!! Oh well, as a Unix Administrator there is always something new to learn, and something is only easy if you know how !! If you found this step-by-step tutorial useful then share it to your friends ! Nagios System Monitoring application is one of the most popular tools used by Sysadmins around the world. Sure it has its issues, or things it hasnt been upgraded to do (like better notifications especially in a smartphone age), but it has proved to be a reliable application none the less. I have used Nagios for various companies I have worked for for over 10 years now, and the main thing I have always had in my mind when implementing it is to ‘USE IT FOR WHAT IT IS INTENDED’. This article attempts to detail how a Sysadmin should use Nagios, the environments it is most suited for, and how you can maximise its benefits. My role as a Sysadmin over the years has been mainly as an Integrator of systems. Having started out in IT 25 years ago from a mainframe background, I have seen how business practices and technology advances have evolved to better meet business needs. As IT technology and infrastructure improved we started to see large companies and corporations migrate their core systems from hugely expensive mainframes in order to get the performance they needed for their applications, to much more modestly priced servers, and then on into modular structure, with multiple servers, performing specific tasks, that together provide the business with the functionality it needs to achieve its goals. This proliferation of physical quantity of servers had some consequences. Some people would say the major downside could be that multiple servers mean more ways for business functionality to have a problem (2 servers, twice the chance of an issue compared to 1 server… 10 servers, ten times the chances… etc). But any company director would tell you that company priorities and direction are an ever evolving set of things. Whether it is gaining more customers, improving the services it currently provides, looking to expand into new markets, or improving the efficiency of its workforce to meet the corporate challenges that we face. Long gone are the days of buying a $1million beast of a server that performs all of these tasks, where it works out much more cost effective to buy multiple servers with the hardware and software characteristics best tuned to perform specific elements of a company infrastructure. Whether it is to enable better communication internally or externally with email or other messaging services, administering the company payroll and HR system, giving your company its external facing front end website, providing your marketing team with the reporting tools and statistics it needs, to not only analyse, but improve the way it works or identify new directions and opportunities. Each of these tasks (and many more as well) are distinct roles in the whole business vision, that even in isolation, provide a valuable service for any company. Have a problem with 1 server now means you do not lose ALL of those elements ive described above, therefore lessening the business impact of any hardware or software problem. Lets get back to the main topic of this article, but I think it is very important to get things in perspective from a company point of view as opposed to an IT point of view. Your IT infrastructure is only their to help your business achieve its goals. One thing that hasnt changed too much in the last 20+ years, is the function of your system administrators and operations IT team. Whether your team is based in your datacentre, or spread around different offices in your country or even globally, they need to have the tools to spot potential issues, and to be able to react appropriately in order to resolve them in a timely manner. This where the multitude of system monitoring tools like Nagios come into play. Nagios is the most recognised and ‘matured’ product out there, it has 1000s of metrics for you to choose from to measure and alert on the key metrics within your infrastructure from memory usage, disk usage, snmp nodes, number of processes, server load etc etc etc. Depending on the size of your server suite or organisation structure, Nagios allows you to group hosts or services into groups. I have worked for some large organisations, but can honestly say that I have never had the need or inclination to add that level of configuration and management of it in a live environment. An alert is an alert, and you want to know about it ! When I say ‘an alert is an alert and you want to know about it’, that is one of the main things for a system administrator to consider when implementing Nagios into their organisation. Nagios is an ALERTING tool, that means for every issue that you configure to alert you for, then there must be a solution that can be done in order to resolve it. This way of thinking is especially important in a multi-level support team. For example you have an operations team which is your 1st line support. Whether your work processes include 1st level support fixing issues or simply monitoring them, it is still important for them to have the detail of knowledge to know a) this is the problem, and b) this is how it will be fixed. Whether 1st line support actually performs the fix, or contacts someone else to do it, that knowledge builds a better understanding of an issues criticality, possibly what it impacts, and how it is resolved. Every environment is different, and even different servers for different business purposes have different characteristics that help a system administrator to configure Nagios optimally. Getting an alert at 03.00 for a disk that has 10Gb space left available MAY be critical to an organisation which relies on large file uploads from a customer, however for a small internal mail server then its maybe not something that needs to wake you up. Nagios has both a server side configuration (the nagios server), and a client side (the servers you are monitoring). Note that the Nagios server is ALSO important as a server to be monitored!! Problem on your Nagios server means potentially you are not monitoring all your other servers ! At the core of the Nagios server are your hosts and services definitions. These are 1) the hosts you are monitoring, 2) the services on each of those servers you need to check, and 3) how regularly you need to check each of those services. Once again these can be determined by a system administrator, BUT really they should be decided within your whole IT and Business Criticality team. Problems mean downtime, downtime means loss of revenue, loss of revenue impacts company performance and goals. Using the above as an example, is 485 processes unusual? Can you do anything to fix it? Does it highlight a real issue? Does the fact that your IPMI connectivity to the server is not working? What is its business impact? Does someone immediately need to update some operating software just because there is a new release of something? Should you be so irresponsible to even think of doing that without testing it first, or at least knowing what the update addresses/fixes ??!!! If you really need to know about your disk with 10Gb space left, and you need to know about it immediately, then you set that specific check to happen every 1minute. If you need that check to happen on 50 servers, then sure you can do that as well, but then you will start to see as you add more and more services to be monitored more and more frequently, that you are building load on your Nagios server, as well as your network, and possibly each client server as well. There is always a compromise, checking 5000 services every minute may be perfectly ok in your environment, but what happens if 20 of those services all has a problem at the same time? Then you need to have the manpower resource in order to fix those issues. Just think very carefully when configuring your alerts to raise only the ones which have potential business impact. It has the functionality to alert, recheck and monitor all of your nagios instances and services. Maybe not the prettiest of apps, but lets be honest Nagios is not the prettiest of applications even in a web environment! But it does its job well if it is configured properly. 1) Plan your Monitoring and Alerting. Is there immediate remidial action that can be taken to resolve the issue? How often does X need to be checked? If X fails, how does it affect my business? Is issue X more critical than issue Y? Get your priorities right! 3) Monitoring something ‘because it can be monitored’ is not the way Nagios should be used. Maybe there is a better tool to track your server load average? Once again Nagios CAN be, but also may not be, the best way to measure if you meet your SLA criteria. This Megapolis review is based on my time since early in 2016 when I first started playing this game. Megapolis is one of those City Builder type games that have been around for very many years now, but each one has its own features that makes it unique. With frequent updates Megapolis has kept my interest going from what some people might call ‘tedious’ activities that you basically have to do each day. ok so down to the main part of this review…. Im not sure what spec Android platform is recommended to play Megapolis, but my Minix X8-H Plus works just great !! The graphics (once main parts of the game have been cached to your device) are bright, fast, and dynamic. There are no specific settings to improve or reduce the quality that ive seen, and to be honest it doesnt need any as it works just fine. The aim (same as any city building game) is to become your own city manager, increase population, build factories, dig tunnels, manufacture goods and services, build your army, fly into space etc etc ! 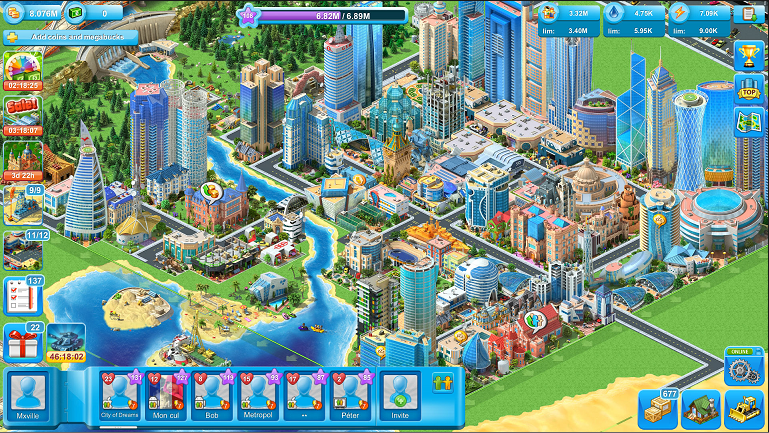 As I can make out from various forums Megapolis is a mature game that has many players from around the world, which says to me the devlopments and improvements the development team makes has kept users interested and playing along. I will talk a little more about multiplayer a bit later in the review, but for now will say that there is some limited multiplayer functionality within Megapolis. Your quest is to build your own London or New York (or whatever city you come from), starting with basics like some small houses, a petrol station and a hairdressers, and then as you get more income you start building better factories making cars, buses, satellites etc etc as your empire grows. As your tiny village grows and grows and you earn more and more money you start to build skyscrapers, open a bus and rail network, install a cellphone network, mine for coal, open a steelworks the list really is endless ! 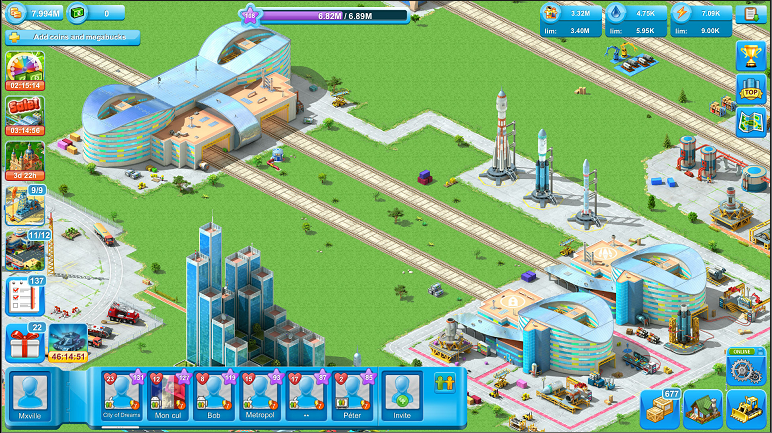 What I dont like about the in-game purchases within Megapolis is that your progress without them s VERY slow. the achievements you get when completing tasks is simply not enough to keep you interested long enough. I would say that the developers and marketers of Megapolis do need to look into this as at times it does feel a bit demanding for you to see progress and new angles to the game that you have to spend more and more money on it. Saying that however if you are a patient person who likes to work hard to gain your achievements, then you can do it! 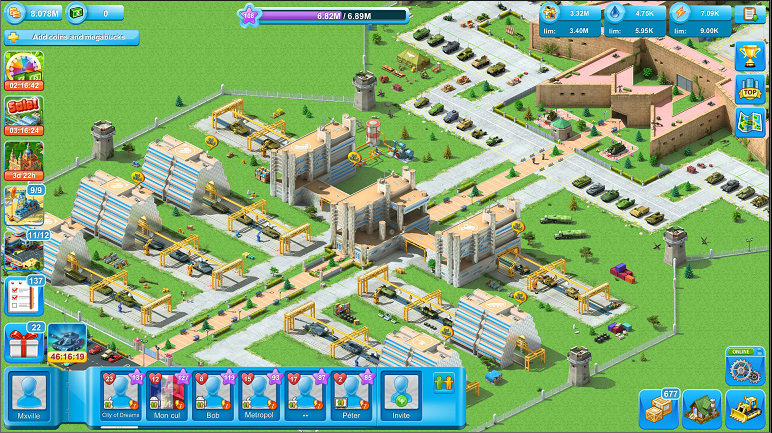 Megapolis does have some multiplayer functions in it like the Military Battles where you compete with other players in the game to earn the most points achieving a target which then can earn you rewards and freebies to buy more supplies etc to improve your city. I actually won one of these tournaments and got some credits to help me finish building part of my military base! One thing that could really be improved is some communication channel where you can actually speak to other users in the game, whether its some messaging or newspaper functionality, or even an improved method of suggesting to other users your aims for your city and how other users can help you achieve it. However out of any of the games ive played on my Minix TV Box, I dont think ive really found a game that was multiplayer enough for me. To end this Android Game Review here is my summary of Megapolis. Its fair to say that as I am still playing the game after nearly a year that it is addictive! 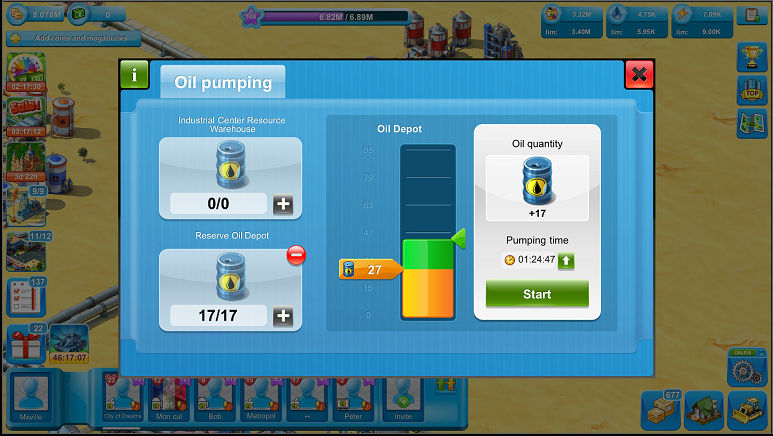 If you are in a hurry to build an empire in a month then you will need to spend a fair amount of money with some in-game purchases, but if you are happy to progress at a slower pace (sometimes an annoyingly slow pace…) then you will have fun along the way, just dont expect to be top of the leaderboards in the first year !! Having used Flussonic for well over a year now here is my review of it as a Media Server in a Business Critical or High Availability environment. I am a bit unsure of accurate details, but the following is my understanding of the history to Flussonic Media Server. Flussonic is a renamed product based largely on its earlier product name of Erlyvideo which from other projects I worked on, I became at least aware of its existance over 5 years ago. Erlyvideo seemed to be a russian product (at least a lot of its usage, forums and posts are by a mainly russian audience). I may be totally wrong but have a feeling Erlyvideo was a free product, so maybe the rebranding of it was to enable it to be sold to customers, but as I say I am not certain of that by any means so read with a large pinch of salt! In this Flussonic media server review I will focus on what I consider key elements of any media streaming environment including features, stability, maintenance, implementation, as well as other things you should consider before using Flussonic. Up to 20 000 of simultaneous views from a single instance. From a Live Streaming point of view I would say its biggest feature of the above is its core built in functionality to output in quite a large variety of output formats (RTMP, RTSP, HLS, HDS, HTTP MPEG-TS and partially DASH). This makes it one of the most complete set of output formats of pretty much any media server I have seen previously. From a VOD point of view the same applies as I said above that the range of output formats is one of the largest I have seen in any media server making it a real plus. One of Flussonics great strengths is not only its ability to output in a wide range of formats, but also its ability to read in data in a variety of different formats from a variety of different sources. If you have an IP Camera that plays its output over an RTSP stream, or if you receive IPTV from your ISP through multicast udp streams, or you are migrating from Adobe Flash Media Server and getting your content through a video card and streaming it currently using Flash Media Live Encoder, or even if you have found someone elses open RTMP stream you want to pull to your server, then flussonic can read that data and stream it out in its array of formats. DVR capabilities of flussonic are pretty straightforward to configure for each stream. You basically set the amount of days of DVR content you require for the channel and flussonic will store it in its proprietary format in the directory structure you configure in its config file. Flussonic will take care of tidying of old data periodically. Backup streams are a pretty cool feature on Flussonic Media Server. You have the ability to set multiple inputs to a stream, this enables you as an example to have a primary input from satellite input, a second input from a rtmp stream you found somewhere on the net, and a 3rd input which could be a backup stream with a test card which will be used when the other 2 inputs are not available. As I said above it is possible to seperate parts of flussonic onto multiple servers to suit your network and server infrastructure. If you come from a Flash Media Server background then you will probably be aware of the Origin – Edge concept to seperate your input streams (origin server), and your end user access (edge server). Flussonic has this functionality including Edge server caching capabilities which not only reduce network traffic between your Edge and Origin servers, but speed up content access times for your end users who can read cached data instead of having to grab it from the Origin. Flussonic Media Server – The Pros and Cons.. So far in this review Ive focussed on flussonics capabilities and features. It all sounds very positive I think, HOWEVER these next sections will bring you back down to earth with quite a bang…. There are more pros which ive hinted at already, but now is time to highlight some of the bad parts of Flussonic Media Server…. 1) Pricing…. always a primary consideration for any company. When a site is VERY KEEN to offer you a FREE TRIAL, but you have to contact them to find out a purchase price, you are instantly turned OFF even looking! I would 99.9% of the time agree with you and look around for something else. 2) Support and ability for you to resolve issues yourself. As I said at the start of this review Flussonic is a rebranded (or renamed) product based on the russian product Erlyvideo. This means that a) most of the documentation was written in Russian first, and then translated into English, b) searching related forums for solutions to any questions you may have will also involve a hefty amount of Google Translate to find you any answers. The modular approach to Flussonic is one of its best features, but also its greatest downfall. In order to get the best results from your Flussonic installations requires you to perform a HUGE amount of monitoring. That in itself is not neccesarily a bad thing, and as a Systems Administrator I would always advise strongly that monitoring of your services is core to ensuring high availability. What lets Flussonic down is a lack of a central monitoring methodology when you have built any multi-server flussonic environment. The Flussonic API is a start to help you program your own monitoring system, but (as is often the case) if the API or server has some problems, then your monitoring could potentially fall apart along with Flussonic as well. Change Control seems very flakey within Flussonics technical support and development teams. With every new release (normally monthly approximately) they have a Google Group (https://groups.google.com/forum/#!forum/flussonic) where they publish the bug fixes and developments in each release. On the face of it that all looks pretty cool, however what they almost NEVER seem to do is any thorough TESTING of their code to test their solutions actually resolve the issues it is intended to fix, AND MORE IMPORTANTLY, from a non-disturbance point of view, to make sure previously working elements of Flussonic are still working !! What that last paragraph should therefore confirm to you is that YOU should be very prepared to perform YOUR OWN TESTING PLAN once you upgrade or change ANYTHING within Flussonic Media Server. As I previously worked in a UK government systems administration role this was always a standard procedure, but in smaller companies like the one I work for here in Georgia attention to detail, change control, and implementation management is largely overlooked, which has caused us multiple instances where upgrades to Flussonic have caused us many more problems than solutions. As I have already said Flussonic Media Server has a large suite of options and possibilities for any media streaming environment. However that means that with every option you decide to use you should have a suitable and thorough testing plan prepared. I have written my own set of both monitoring and testing scripts which mean I can not only keep on top of implementing new developments to my Flussonic environment, but more importantly be notified of issues on my current production environment. – Each used output format stream (HLS, RTMP, HDS etc). Flussonic API has a variety of tools you can use to test your streams, but it is only monitoring from a SERVER point of view. What is more important, is monitoring and testing your streams from a CUSTOMER point of view ! Are your end users able to view your streams using whatever devices you have enabled? You can read other articles on Bashworkz for tools such as ffmpeg and AdobeHDS, or get in touch on the contact page if you need some help or advice to implement a customised monitoring system which works for you! – Checking your stream has both a video and an audio output stream. Nothing is worse for a viewer when they tune into your stream and either get a picture with no sound, or get sound but there is no picture! – Im going to mention Video / Audio synchronisation although it is one of the most complex areas for pro-active monitoring to be performed. To add to the complication is any environment or stream which includes audio dubbing which can inherently be out of sync marginally. Its just something to be aware of, and you should put in place whatever (even manual) checks to ensure your streams are working as you expect. – DVR functionality (if enabled) should always be checked following any upgrade of Flussonic. Whether you have it configured to work through a customer facing Edge server, if you have caching enabled, or if you have configured to view using a core Origin server, all variations should be checked for non disturbance. This sort of testing can also be automated using ffmpeg or AdobeHDS using elements of Flussonic API to view a previous timestamp of a stream with a timestamped url to your stream. – Automated or manual checking of Flussonic log files is another element that should not be forgotten about in your testing plans. The logging within Flussonic Media Server is actually pretty good, so should be reviewed in either a script automated process, or at least manually following any changes or flussonic upgrades, as well as on a regular running day to day basis. 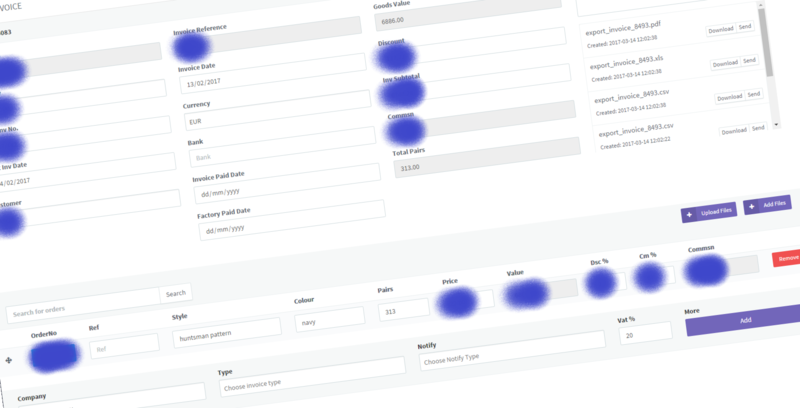 Being familiar with the logs can be crucial in identifying ‘out of the ordinary’ issues, but be aware that on occasions Flussonic do change the formats or information shown within their logs between versions, once again highlighting the need for controlled testing prior to implementing a new release into a production environment. 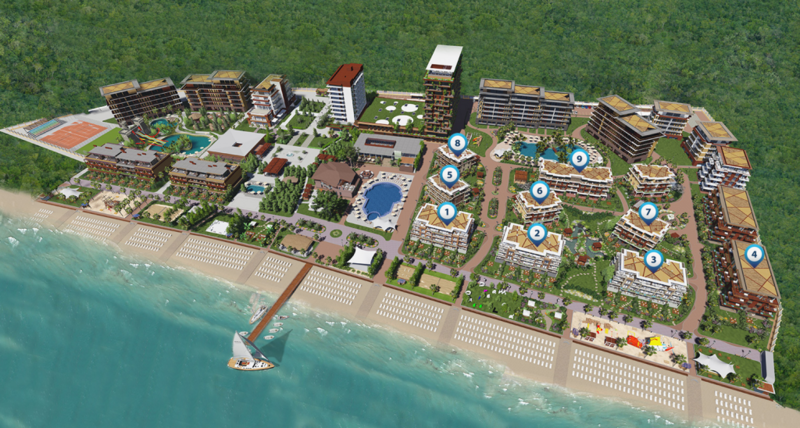 4) Upgrades should be treated with the same level of change control as any new system project implementation. It would be (in my opinion) a reckless decision to upgrade to the latest version, without performing a LOT of non disturbance testing yourself prior to implementation into your Production environment !! Chroot SFTP configuration on CentOS 6 – Guide / Tutorial. One of the biggest concerns of any security conscious Unix Admins is how to secure SSH and SFTP access to a server. Todays post will show you how to secure SSH to specific users, and limit other specified users to SFTP access only. 5) Restart sshd to take effect! So lets take each one in turn. the 1111 can be any id number you want. The trickiest part but its actually not so hard, and ive written a little bash script which will do what you need based on the group id you used to create your sftpusers group earlier. 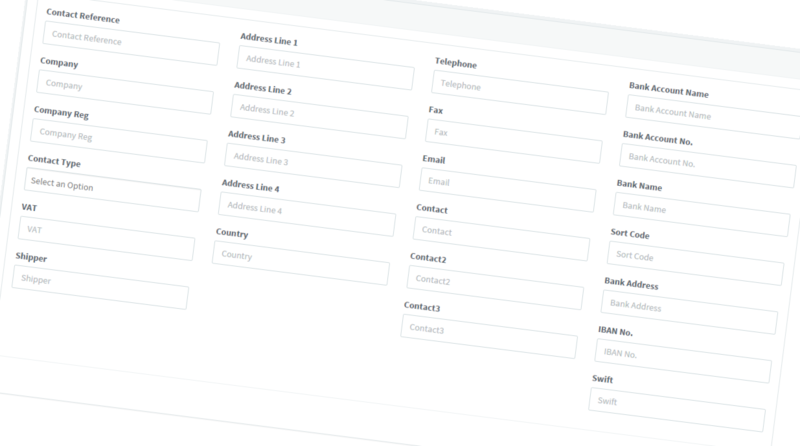 If (like me) your users use /home/xxxxx for their home directories then this is still perfectly possible. You simply want to make the HOME area owned by root only, and only directories under the home directory to be read or writable to the specific username. Line 1 – Get a list of users which have a group id of 1111 (group you created earlier), extract the username (1st column before :), and then read each line. Line 3 – Now you are setting the owner of the full home directory to be root and group to root as well. Log in and get a file! Bash script automated image capture from multiple public webcams using ffmpeg to generate a set of timelapse videos from the Dreamland Oasis construction site in Chakvi, Georgia. The videos are an example of what can be achieved using ffmpeg to capture an image from a live stream, along with concatenating the 1000s of images together to make a timelapse video. The images were extracted from the public webcams on dreamland.ge website since 2014 (there was 1 webcam originally and they added more as time went by), which were then merged into the 5 timelapse videos you can see below. How to extract emails from a PST file using Bash on Centos – Todays post explains something I have been looking to do for some time now to extract the email data from a PST file. If you have ever used Microsoft Outlook then you might be familiar with the famous (or infamous) pst data files your emails get stored in. Nowadays most people have migrated their email addresses to either Gmail, or other online platform for a variety of reasons, but probably one of the main reasons has been so you dont lose all your emails after you reinstall your OS, or have a problem with your disk. With an online service at least your emails are stored in the cloud! The data in an email file is not the prettiest of things, but with some more bash scripting (i will keep this in mind for a future article) getting the useful data out can be very useful. So for todays post we will just do the basics… extract your emails while keeping the folders intact on Centos. If you so a ‘yum search libpst‘ first you will find the package name for the 32 bit version if you need. The install will automatically install a dependency libpst-libs for you. After the install is complete you now have a very useful command readpst. Put your pst file in /tmp/work just to keep things in the same place. "Sent" - 7 items done, 0 items skipped. "Personal Folders" - 15 items done, 0 items skipped. "Tasks" - 0 items done, 1 items skipped. "Journal" - 0 items done, 1 items skipped. "Calendar" - 1 items done, 5 items skipped. "Junk E-mail1" - 2 items done, 0 items skipped. "Inbox" - 3491 items done, 5 items skipped. As I say I will get around to writing a followup article with some more examples of how you can extract specific information from your emails, but basically grep, sed, and awk will be the major tools you need to get what you want out! If you like this article then please subscribe to my blog, and be sure to check out more bash script tutorials from the menu at the top of the site.